Vote of Confidence A huge black turnout in November 1992 altered Chicago's electoral landscapeand raised a new political star: a 31-year-old lawyer named Barack Obama. By Gretchen Reynolds A huge black turnout in November 1992 altered Chicago's electoral landscape-and raised a new political star: a 31-year-old lawyer named Barack Obama. In the final, climactic buildup to November's general election, with George Bush gaining ground on Bill Clinton in Illinois and the once-unstoppable campaign of senatorial candidate Carol Moseley Braun embroiled in allegations about her mother's Medicare liability, one of the most important local stories managed to go virtually unreported: The number of new voter registrations before the election hit an all-time high. And the majority of those new voters were black. More than 150,000 new African-American voters were added to the city's rolls. In fact, for the first time in Chicago's history-including the heyday of Harold Washington-voter registrations in the 19 predominantly black wards outnumbered those in the city's 19 predominantly white ethnic wards, 676,000 to 526,000. The election, to some degree, turned on these totals: Braun and Clinton had almost unanimous support among blacks. But just as important, if less obvious, are the implications black votership could have for future city and state elections: For the first time in ten years, more than half a million blacks went to the polls in Chicago. And with gubernatorial and mayoral elections coming up in the next two years, it served notice to every¬one from Jim Edgar to Richard M. Daley that an African-American voting bloc would be a force to be reckoned with in those races. None of this, of course, was accidental. The most effective minority voter registration drive in memory was the result of careful handiwork by Project Vote!, the local chapter of a not-for-profit national organization. "It was the most efficient campaign I have seen in my 20 years in politics," says Sam Burrell, alderman of the West Side's 29th Ward and a veteran of many registration drives. At the head of this effort was a little-known 31-year-old African-American lawyer, community organizer, and writer: Barack Obama. The son of a black Kenyan political activist and a white American anthropologist, Obama was born in Hawaii, received a degree in political science and English literature from Columbia University, and, in 1990, became the first black editor of the Harvard Law Review. In 1984, after Columbia but before Harvard, Obama moved to Chicago. "I came because of Harold Washington," he says. "I wanted to do community organizing, and I couldn't think of a better city than one as energized and hopeful as Chicago was then." He went to work for a South Side church-affiliated development group and "was heartened by the enthusiasm." But barely three years later, Washington died, and Obama, convinced he needed additional skills, enrolled at Harvard Law School. The African-American community he left, rent by political divisions and without a clear leader, went into a steep decline. By 1991, when Obama, law degree in hand, returned to Chicago to work on a book about race relations-having turned his back on the Supreme Court clerkship that is almost a given for the law review's top editor-black voter registration and turnout in the city were at their lowest points since record keeping began. Six months after he took the helm of Chicago's Project Vote!, those conditions had been reversed. To understand the full implications of Obama's effort, you first need to understand how voter registration often has worked in Chicago. The Regular Democratic Party spearheaded most drives, doing so using one primary motivator: money. The party would offer bounties to registrars for every new voter they signed up (typically a dollar per registration). The campaigns did produce new voters. "But bounty systems don't really promote participation," says David Orr, the Cook County clerk, whose office is responsible for voter registration efforts in the Cook County suburbs. "When the money dries up, the voters drop out." Nor did the Democratic Party always vigorously push registration among minorities, Orr says. "It's not that they discouraged it. They just never worked hard to ensure it would happen." All of that changed with the ascension of Harold Washington. In the months just prior to his 1983 Democratic primary win, 120,000 new black voters were registered, most by registrars who received no bounty. Off in Washington, D.C., those efforts were scrutinized with great interest by the founder of a new voter-registration organization. Sandy Newman, a lawyer and civil-rights activist, had founded Project Vote! the year before to promote registra¬tion among low-income and minority voters. At the time, his operation was still centered in the nation's capital, pioneering such now-commonplace practices as registering people at food-stamp and welfare offices. While Project Vote! was indi¬rectly involved in the Harold Washington registration effort, donating money to the black wards' voter-registration drives, it did not start a branch in Chicago. "The group already at work there was fine," Newman says. "We decided to support them with funds, rather than compete with them." Even after the minority-registration effort in Chicago fell apart following the death of Washington, Project Vote! opted to avoid Illinois. "The Democratic Party in Cook County was still actively using a bounty system for most registrations," Newman says, "and we didn't wish to get associated with that." Carol Moseley Braun's upset primary victory over Alan Dixon last March altered Newman's feelings. "It's not that I wanted to influence the Senate race," Newman says. "Project Vote! is nonpartisan, strictly nonpartisan. But we do focus our efforts on minority voters, and on states where we can explain to them why their vote will matter. Braun made that easier in Illinois." So Newman decided to open a Cook County Project Vote! office and went looking for someone to head it. The name Barack Obama surfaced. "I was asking around among community activists in Chicago and around the country, and they kept mentioning him," Newman says. Obama by then was working with church and community leaders on the West Side, and he was writing a book that the publisher Simon & Schuster had contracted for while he was editor of the law review. He was 30 years old. When Newman called, Obama agreed to put his other work aside. "I'm still not quite sure why," Newman says. ''This was not glamorous, high-paying work. But I am certainly grateful. He did one hell of a job." Within a few months, Obama, a tall, affable workaholic, had recruited staff and volunteers from black churches, community groups, and politicians. He helped train 700 deputy registrars, out of a total of 11,000 citywide. And he began a saturation media campaign with the help of black-owned Brainstorm Communications. (The company's president, Terri Gardner, is the sister of Gary Gardner, president of Soft Sheen Products, Inc., which donated thousands of dollars to Project Voters efforts.) The group's slogan-"It's a Power Thing"-was ubiquitous in African-American neighborhoods. Posters were put up. Black-oriented radio stations aired the group's ads and announced where people could go to register. Minority owners of McDonald's restaurants allowed registrars on site and donated paid radio time to Project Vote! Labor unions provided funding, as, in late fall, did the Clin¬ton/Gore campaign, whose national voter-registration drive was being directed by Chicago alderman Bobby Rush. "It was overwhelming," says Joseph Gardner, a commissioner of the Metropolitan Water Reclamation District and the director of the steering committee for Project Vote! "The black community in this city had not been so energized and so single-minded since Harold died." Burrell agrees. "We were registering hundreds a day, and we weren't having to search them out. They came looking for us. African Americans were just so eager to have a say again, to feel they counted." "I think it's fair to say we reinvigorated a slumbering constituency," says Obama. "We got people to take notice." The question now, of course, is what lasting impact Project Voters efforts will have on Chicago and Illinois politics. Joseph Gardner says it will be considerable. "In this town, numbers talk," he says. "Who can afford to ignore 600,000 voters?" He says he is confident turnout among black voters in Chicago will remain at nearly that level during future elections. "We tasted victory in November. It was intoxicating. We won't go back to being silent." Other observers are more skeptical. "Turnout was high because of Braun and because people, especially minorities, were so angry and ready for change at a national level," Orr says. "It's not likely we'll see the same levels in local elections." One Daley insider says the Mayor took particular note of the increase in black participation. "How could he not? But does that mean he starts looking over his shoulder for a rising black political star to run against him? No." Before his 1989 victory, the Mayor received contributions from many black-owned businesses and black voters. "I think he's pretty comfortable with his support among blacks," this insider says. "But he's not complacent. Look what happened to Al Dixon." As for Project Vote! itself, its operations in Chicago have officially closed down. Barack Obama has returned to work on his book, which he plans to complete this month. He also is teaching a class at the University of Chicago law school, and is an attorney at Davis Miner Barnhill & Galland. But he continues to consult with the church, community, and political groups involved in the monumental registration drive. "We won't let the momentum die," he says. "I'll take personal responsibility for that. We plan to hold politicians' feet to the flames in 1993, to remind them that we can produce a bloc of voters large enough that it cannot be ignored." Nor can Obama himself be ignored. The success of the voter-registration drive has marked him as the political star the Mayor should perhaps be watching for. "The sky's the limit for Barack," says Burrell. Some of Daley's closest advisers are similarly impressed. "In its technical demands, a voter-registration drive is not unlike a mini-political campaign," says John Schmidt, chairman of the Metropolitan Pier and Exposition Authority and a fundraiser for Project Vote! "Barack ran this superbly. I have no doubt he could run an equally good political campaign if that's what he decided to do next." Obama shrugs off the possibility of running for office. "Who knows?" he says. "But probably not immediately." He smiles. "Was that a sufficiently politic 'maybe'? My sincere answer is, I'll run if I feel I can accomplish more that way than agitating from the outside. I don't know if that's true right now. Let's wait and see what happens in 1993. If the politicians in place now at city and state levels respond to African-American voters' needs, we'll gladly work with and support them. If they don't, we'll work to replace them. That's the message I want Project Vote! to have sent." This article appears in the January 1993 issue of Chicago Magazine. Obama had a lot of help from others for the Project Vote campaign; yet, I wonder what he said to the black community to get them all FIRED-UP and READY-TO-GO? He did tell Harry Reid that he HAS A GIFT! The link to the story isn’t working? The dems understand that the way to keep 90% of this voting block is to continue the stream of taxpayer funded goodies coming. The blacks have been programmed to be socialists and that fraud in the WH is their messiah leader. Sure. Non-partisan in name to avoid taxes. If you focus your registration efforts on demographics that vote overwhelmingly in a partisan manner, you are not non-partisan. any article tying zero to Acorn,to eating brains,to have been raised in kenya,anything at all,is meaningless until the day some msm anchor says the following.”there are disturbing new allegations tying Obama to...” Until those bozos get it,until the fourth estate wakes up or is replaced,theres very little that will matter. 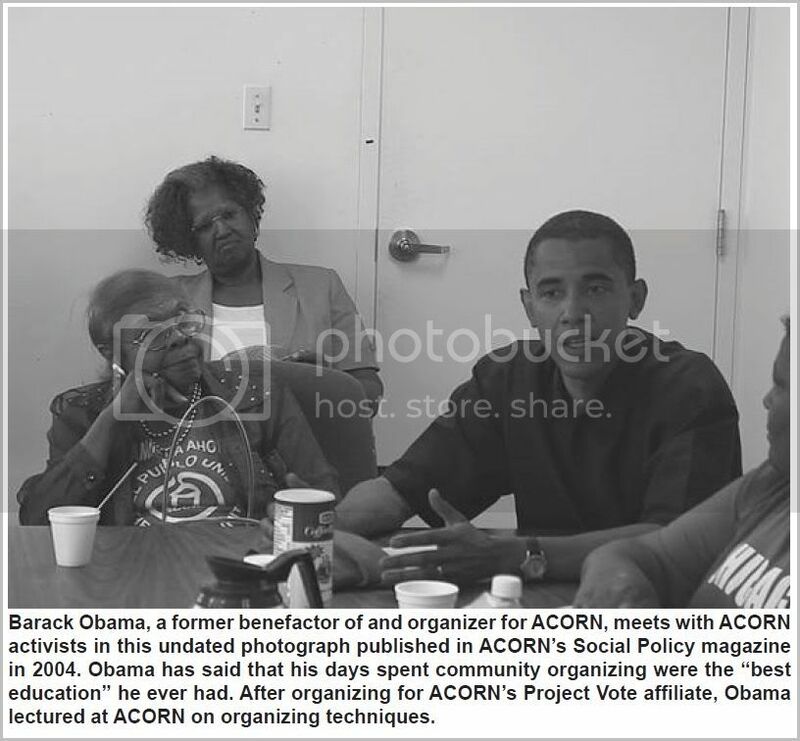 BO got $800,000 from ACORN, along with hundreds of thousands of fraudulent votes, in ‘08. They recycled our tax dollars, given to them by the stupid Bush administration, to throw out Republicans. Has the GOP learned anything from this experience? I doubt it. So was the real purpose of McCain/Feingold about affirmative action???? You seem to be saying that the MSM is considered the ultimate authority on truth and that is a sad fact. However, going forward it's a different game. They're not doing everyone's thinking for them. Viva la [information] Revolution! As bad as it is, it has an upside. Barack Obama is all over the place. You see his campaign signs along all the roads and his face plastered all over the newspapers and TV. To those conservatives who indulge a psychological need to disparage the talents of Barack Obama, this article should serve as a well earned slap in the face. To those conservatives, like myself, who are arm chair bean counters in the game of handicapping elections, let this article be a disquieting wake-up call that many of our assumptions upon which we hope conservatism will build a come back may be as ill-founded as the bluster of those who downgrade Obama's talents. "I think he is a narcissist who survives and prospers not by addressing problems but by manipulating people. Narcissists like Bill Clinton or Barack Obama are not stupid, they are wonderfully clever and exceedingly effective in reading their victims and manipulating them. I think that Barack Obama has a worldview provided to him, posthumously, by Saul Alinsky which gives him a framework for analysis. In other words, Obama does not "analyze", rather he "sorts" and puts data into their appropriate slots provided by the philosophy of Saul Alinsky. He has learned a vocabulary which enables him to contrive a front of effectiveness, a seriousness of purpose and depth of character which is all a sham. Think of Barack Obama as the professional coordinator at its Alinsky meeting. For those old enough, think of Barack Obama as the leader of an EST meeting of the 1970s. These experiences give him an eschatology, a vocabulary, a forensic ability to manipulate, and ego satisfaction. What was he doing as editor of the Harvard Law Review if he was not producing actual work? He was acting out as a community organizer with the shtick modified to fit a new venue. If one examines his career at every level the pattern is the same. As a constitutional law lecturer he produced no written work but he was evidently perfectly fit to the culture of the law school. In the Illinois Senate he voted present but ingratiated himself with the Daley machine. He barely passed go in the United States Senate but he knew the vocabulary and he passed muster with the likes of George Soros. In each instance, Barack Obama behaves as a narcissist, very shallow, producing no work product, but selling a great package. If one takes away the Marxist belief system provided to him or reinforced in every step of his development from his mother to Frank Marshall Davis, to Columbia University, the Harvard Law school, William Ayres, to Reverend Wright, one is left with a truly hollow man. That is why Obama is such a dangerous ideologue. There is no Obama apart from a lifelong sham, a compensation for always being advanced beyond his competence because of his race and his ability to manipulate. He simply cannot stop the act and get off stage because there is nothing but the act. Obama is a man without a soul and without a spiritual compass. His relationship to Reverend Wright reveals that he has no real spiritual quality to him for there could hardly be a more right apostasy in the church which he attended for 20 years. It has nothing to do with spirituality and everything to do with ego satisfaction. It is the opposite of the Judeo-Christian message. Obama cannot abandon his radicalism because there is no other there there. He is a massive compensation system. His body is a life-support system for his narcissism and the narcissism is utterly dependent on the received wisdom from Saul Alinsky and the rest of them." Viewed from the perspective of this article, one might properly question whether I got it wrong about Obama relying on his ability to manipulate rather than upon him a capacity to produce honest results. Reading the article, it appears that Obama's success was primarily a public-relations phenomenon in enlisting black McDonald's owners and black radio station owners. The worry is that the voter registration drive is a model of both public-relations sensitivity and dynamic management skills in organizing and harvesting the black vote. If I got it wrong, if it is the latter, if the Chicago voter operation is truly an example of honest results, it is ominous in the extreme. This interpretation is ominous because we can find parallels to the 2008 election and to Obama's course of governing. The enlistment of black radio station owners and the attempt today to kill talk radio by forcing it into African American hands stands as an example. The article speaks of Obama's training 700 registrars. This echoes my remarks about his forensic skills and narcissistic needs merging as was the case for EST trainers of the 1970s. This explains much of Obama's need daily, actually by count more than daily, to appear on television. It also confirms the foolishness of those who complain that Obama cannot speak without a Teleprompter. Is Obama only a narcissist, a Bill Clinton style sociopath, or is he the real deal as his supporters claim, a man who has unperceived talents to produce honest results and organize a Chicago voter drive, a successful primary campaign, a successful presidential election campaign? Parenthetically, it is interesting to note that when pressed for a single qualification which entitled Obama to be president, his supporters fell back on his ability to run a campaign. Before we conclude that Obama has wonderful organizing skills, let us note that in each of these three incidents, all three of them campaigns, Obama was working with race. In the voter drive it was 100% a race effort. In the primary campaign it got down to a nasty slugfest over race between Obama and the Clintons. In both the primary and in the election campaign Obama enjoyed virtually 100% black voter loyalty. Equally important, in those two campaigns he enjoyed unprecedented media support and that media support was predicated on race. Conservatives clearly will observe that Obama's alleged organizing skills are not so apparent when it comes to governing. But let it be considered for a moment that the governing of the Obama administration still rests on only two legs: the race card and the Saul Alinsky world view. "The conclusion of anyone with common sense who has seen the films of innocent children singing their Obama songs or who has watched the quasi-military chanting and saluting of the Obama Youth in military garb must conclude that there is something very, very wrong with these people. I remember when I first saw the YouTube Children singing their Obama song I became conscious after a while that my mouth was gaping open, so appalled was I. My reaction to seeing the paramilitary gang marching into the karate hall was a mixture of embarrassment that these kids would make such fools of themselves and anger that adults would so brazenly manipulate children. Then I felt a creeping sense of unease that there was something potentially very sinister going on. Dear merciful God, this is Orwellian! Beyond a very healthy repugnance to the spectacle of brainwashed children put on display, beyond the inescapable Maoist symbolism of it all, a commonsense person asks, what kind of man would permit this to go on in his name? What kind of parent would not seek to protect his child from such a man? What kind of pathology would lead parents who presumably love their children to consign those children to the demons of mind control? How could Americans fall for such a transparent cult of personality? Unfortunately, we need not be uncertain about what kind of man would permit this grotesquerie to be advanced in his name. History provides us with plenty of examples: Hitler, Stalin, Mao, and Kim Jong-Il come to mind and now we add Barak Obama to the list. Why has he not spoken out and repudiated this? Would not a decent man do so if only for the children? If Obama will not speak out now as a candidate when a little modesty, even false modesty, would advance his chances, what will he do when he gains office with no resistance anywhere on the horizon; no opposition in either the House or the Senate, no voice in traditional media to be raised against him, no institutional resistance on a national level of any kind organized to discourage him? Because he condones this obscenity one must ask, Is Obama really a narcissist as has been claimed? If so, how far will he go when he has the levers of power in his hands when there is no effective resistance to his ego? How dangerous is Barak Obama? Is he too dangerous to be put in a place where he could literally get us all killed? Or Is he the indispensable man in some sense? I do not think so. There is nothing in his career that suggests that he is the man for this season. In a time of war he has no military experience. In a time of looming financial disaster, he has no economic credentials. If he is potentially dangerous and if he is not indispensable, why would so many people want to put him in a position where he could do us harm, even get us all killed? My commonsense explanation is that there must be a pathology, a mass psychosis, that brings people to the point where not only are they eager to make him the most powerful man in the world but they are invoking his name and calling upon him to be their savior. This they do rather than falling on their knees out of fear of The Real God. This is the Obama pathology. To a middle-class conservative who instinctively rejects conspiracy theories and normally wants to think the best of people because that's what he learned in Sunday school, this deification of an empty suit is as bewildering as it is frightening. What in the world are these people thinking? Do they not weigh the risks of consigning their fate to an unqualified man, worse, a person tainted his whole life with stunningly dangerous confederates including felons and Communists and terrorists? What is the upside? What is it about this man whose career is utterly uninterrupted by any accomplishment which would motivate these people to risk their children and my children to whatever he might do to them? How do they know? How can they be sure? Don't they have any doubts? My problem is that I am seeking after that which I cannot find. I want to find an explanation in logic for a phenomenon of emotion. It is easy for middle-class conservatives to overlook the power of emotion even though history provides plenty of examples even within our own culture in America. Can logic explain why so many drank Jim Jonse's Kool aid? Why Charles Manson commanded such blood loyalty? How many cheered OJ Simpson's acquittal? Why did princes Diana's passing traumatize a nation? These are not questions which are answered with everyday commonsense. One almost has to go to the Bible to see the answer in Old Testament allegory which lets us know that evil is and there will always be worshipers of the golden calf. I fear that in November we conservatives might find ourselves involuntarily embarked upon a journey that is foreign to our epistemology. We may be going into dark places and we might well be pushed into a netherworld where our common sense values are of no use because it is a place where down is up and black is white, a place where gravity does not pull but pushes, a place where we will need a pocket translator in order to converse in English with our government, our children's teachers, and our keepers even though they superficially use the same words we do. We sense we are about to be overwhelmed by forces guided by the ghost of Saul Alinsky. I fear the downside of the Obama Pathology after his election may extend to dimensions we cannot begin to fasten to our everyday understanding or to our common sense. We have no way of knowing what will come because we don't know anything really about Barak Obama. We do not know if he is purely evil, we do not know if he is a committed communist, we do not know if he is a racist, we do not know if he wishes to see the submergence of the United States into a greater world order, we do not know if he is a megalomaniac, we do not even know, God help us, if he hates America. We do not know, in short, if we are backs - to- the- wall confronted with the Liberals' quadrennial nightmare: A real Authoritarian Personality. We do know that Barak Obama has already encouraged a cult of personality whose implications are truly frightening and fundamentally un-American." Do you have a link for that piece, or did you write it all yourself? "My commonsense explanation is that there must be a pathology, a mass psychosis, that brings people to the point where not only are they eager to make him the most powerful man in the world but they are invoking his name and calling upon him to be their savior." There is nothing mysterious about Obama's methods. "A demagogue tries to sound as stupid as his audience so that they will think they are as clever as he is," wrote Karl Krauss. Americans are the world's biggest suckers, and laugh at this weakness in their popular culture. Listening to Obama speak, Sinclair Lewis' cynical tent-revivalist Elmer Gantry comes to mind, or, even better, Tyrone Power's portrayal of a carnival mentalist in the 1947 film noire Nightmare Alley. The latter is available for instant viewing at Netflix, and highly recommended as an antidote to having felt uplifted by an Obama speech. ..."
I'm afraid I am solely at fault.